BLM lists sacred land outside Chaco Culture National Historical Park in newest fracking lease sale | "Global Possibilities"
The Great Chaco Region in New Mexico, which includes Chaco Canyon, is a major center of ancient Pueblo culture and a UNESCO World Heritage Site,” EcoWatch reported. 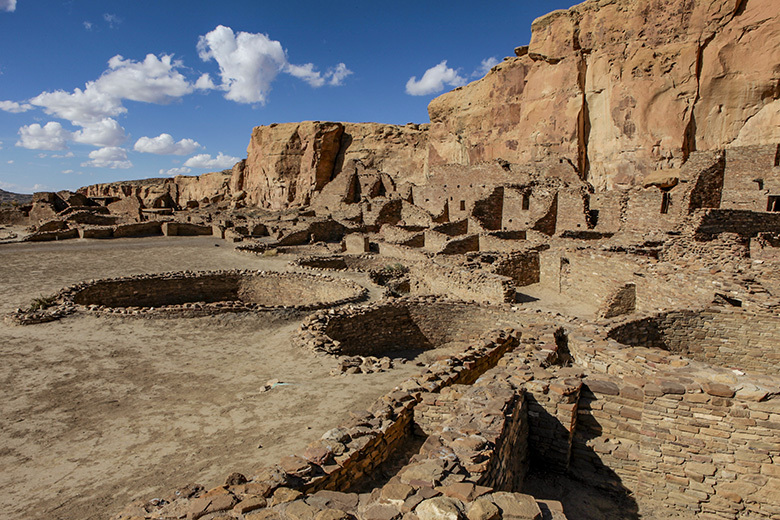 Prior intense protests and public pressure regarding cultural and environmental concerns caused former Interior Secretary Ryan Zinke to postpone a lease sale in the Great Chaco Region. A new protest period, which will accept public comment, will begin on Feb. 11 and run through Feb. 20. An auction is scheduled for March 28, which will include more than 50 parcels in New Mexico and Oklahoma that will be up for grabs, EcoWatch reported. About 90 percent of the Great Chaco Region is currently leased, but the New Mexico BLM wants to expand oil and gas development to as close to the park’s 10-miles, no drilling buffer zone, where more fossil fuel can be found, EcoWatch reported. “We’re looking to New Mexico’s newly elected state and federal representatives to finally address fracking impacts, and with this week’s Executive Order on Climate and a slew of proposed statewide bills aimed at enforcement and accountability around oil and gas, we hope New Mexico can tun the tide and reign in this dangerous industry, protecting our people and sacred landscapes,” Sobel said.